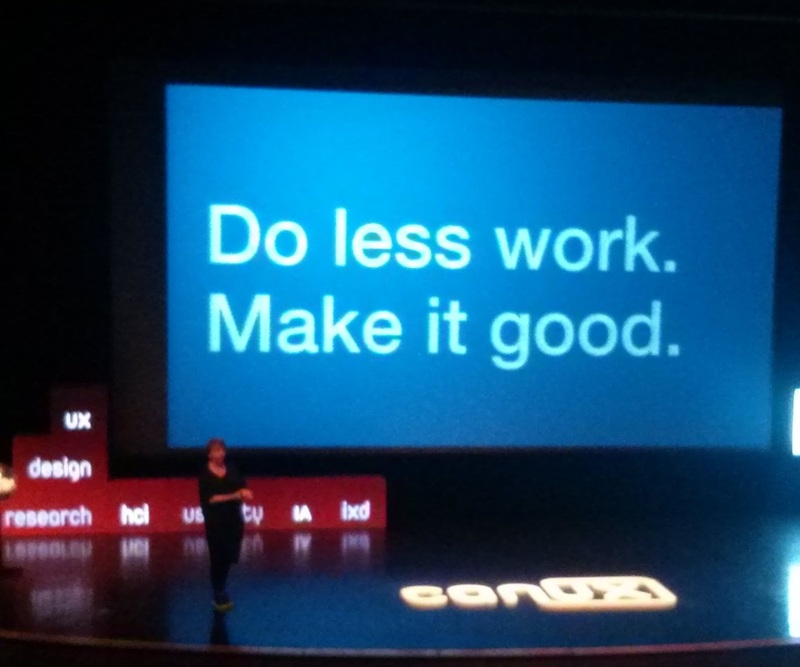 This is not a faithful recording of the CanUX conference from Nov.7-8, 2015 but the things that I most wanted to remember for further action or reflection. Two presentations in particular really resonated with me. Happily, they were the two speakers I was most looking forward to. Shelley Bernstein is the Manager of Information Systems at the Brooklyn Museum and talked about the visitor experience to both the online and physical museum space. She explained that the museum had changed its mission statement to be more visitor-friendly and committed to serving their immediate community. She mentioned that in the mid-2000s (pre-smartphone) they noticed that people wanted to take pictures of the art so they removed their “no photography” policy. This reminded me of libraries trying so hard to enforce so many rules. What are people doing in our spaces? Are there very good reasons to prohibit this behaviour? If not, why not let people do what they’re already doing without feeling like they’re breaking rules? I find this fascinating. Obviously, context is everything here. We try our best to make it easy to use our library systems because they tend to be needlessly complicated. We want to get our users to the content they want as quickly as possible so that they can engage deeply with that content. But are there occasions where it would make sense to actually make things a little more difficult, to slow people down a bit? The obvious answer would be where people are engaging with our digitized collections. But are there others? Would it ever make sense to slow down the research process itself? Not to needlessly complicate it, but to consciously add decision points or interactions beyond click-to-content? Bernstein went on to talk about efforts to improve engagement within the walls of the museum. They put more staff on the floor, wearing (in her words) “hideous vests” to identify them. Visitors LOVED this, asking lots of questions. However, (and this should sound very familiar), this solution simply could not scale with the museum’s many galleries over five floors. Visitors would not always be able to find staff member when they had a question about the work they were looking at. So the museum bought a bunch of iPhones and had them available for visitors to use. They created an app, Ask Brooklyn Museum, that visitors could use to ask museum staff questions. They installed iBeacons around the museum to show staff where people were and what exhibits were nearby in order to provide proper context for their answers. Another great aspect of this is that museum staff now have a huge amount of data about the questions people are asking. They can use this information to make decisions about placement of signage, curatorial notes, etc. That’s really a side benefit though; the main positive aspect is that museum staff now have a way into visitors’ conversations and can use that opportunity to provide a richer experience. A question about the dim lighting around an exhibit provides an opportunity to talk about preservation, for example. Awesome! Oh, and one other takeaway: visitors were as happy to ask questions through the app as they were to people on the floor; they still felt the personal touch of a real person responding to their question in real time. So this made me think a lot about libraries and reference. It’s a different environment for sure. The people in our spaces are not engaging with content that we have created and/or understand deeply; for the most part we don’t interpret content for our users. However, there may be ways we can increase the personal touch of our reference services without having to put our staff all over the library in hideous vests. Leisa Reichelt was the other speaker who I found pretty amazing. She was the Head of User Research for Government Digital Services (known for their great work on GOV.UK) and is now working for the Australian government doing similar work. She started off talking about how a lot of organizations – even GOV.UK – talk the talk about being user-focused but often still rely on analytics and “thinking about users” or “thinking like users” rather than actually doing the work of talking directly to (and testing with) users themselves. Have a rule that a researcher has to be embedded in a team at least 3 days per week (so teams can’t share a single researcher). User researchers should spend about 30% of their time on research (learning about users) and 70% making sure their team knows about and understands that research (helping their team learn about users). Jared Spool has advice about “user exposure hours” that everyone on a team needs to have; if you haven’t spent x amount of time directly engaged in user testing – or at least watching user testing – then you’re not doing part of your job. She talked about how a measure of engagement (traffic + time on page) can often mask experiences of confusion and anxiety as people spend more time on a page if they don’t know what to do. I know I look for very short amounts of time on page for most of our web content. She showed a video of a user struggling mightily with a drop-down box and reminded us that just because certain interface elements are ubiquitous doesn’t make them easy to use. Test test test. She spoke about the discovery phase of research and the importance of figuring out the real problem we are trying to solve. I took that very much to heart, perhaps because that’s the essence of my next research project – taking a step back and looking at students’ research processes. I will try to keep in mind that I don’t know what problem(s) the library is solving. I will try to banish preconceptions about what we do, or what we try to do, and try to focus on what students do. It was a nice and timely reminder for me. In talking about her own transition from GOV.UK to the Australian government, Leisa said she will continue to use (steal) the GDS Design Principles, the Digital by Default Service Standard, and Design Patterns since these were based on a lot of research and continue to have relevance. I’ve read them before but will make a point of revisiting them. It’s important to do capability assessment, not just in terms of skills but in terms of how people are thinking (this reminded me of conversations about job descriptions and expecting people to do all the strategy stuff plus the detail work and everything in-between; I think we have to decide what level is most important — the 10,000 foot view or the 1 foot view — and focus people’s efforts there. They might do all of it, but their strengths should be at the level the organization needs most. If the organization needs all of it, they have to hire or assign people to cover all four levels. Expecting one person to be the strategy person AND the details person and do both well is a recipe for failure. I think Peter’s talk makes that point even more clear. Brent Marshall’s talk was really fun, probably because he was talking about the element of play in design, and creating playful experiences. He talked about helping to create Molson’s Canadian Anthem Fridge (which made an appearance at the CanUX after party) and other interactive installations. He said that play creates memories (reminiscent, I think, of what Shelley Bernstein said about deep engagement). While I’m not a big proponent of the gamification of libraries, I did wonder about what we can do to bring a sense of play, or to enhance a sense of wonder, in our library spaces both physical and virtual. Shannon Lee and Rob Rayson gave a delightful presentation about their award-winning work to build a prosthetic hand for a boy in Ottawa. It was obviously a labour of love for the two engineering students from UofO, and spoke volumes about how hard we can work to get something right when we can tangibly see the good it does and the difference it makes. Ann Marie Lesage talked about her research into the UX of an office chair. Lesage spoke about the aesthetic experience of the chair where you become aware of the experience and then get rewarded for being aware (it’s not just a nice chair to sit in, but you notice that you’re enjoying sitting it in and that makes it more enjoyable). This reminded me of Shelley Bernstein’s comment about deep engagement and Brent Marshall’s talk about play creating memories. Experience plus awareness of the experience can create a better experience. Jennifer Hogan from Getty Images said some interesting things about watching where our users are hacking our stuff. They may be creating functional prototypes that we can then develop further. It would be interesting to see what our students or faculty have done with our stuff, although I suspect they are more likely to hack other things (see #icanhazpdf). With the time lag of space-to-Earth communications (8 – 48 minutes between Mars and Earth, depending on positioning), it’s important to tell the astronauts how long it will take until someone sees their message and the earliest response time they can count on. We provide generic information about response times but being more specific about the actual time lag of student-to-library communications would be useful. Cennydd Bowles gave a talk on how he sees the UX industry changing in the next 5 years or so. I’m not the biggest fan of “future” talks but he raised some interesting points. He said that he doesn’t see another OS rivaling iOS and Android, but made the point that these systems are trying harder to keep their users away from the Web. I hadn’t thought of Siri actively discouraging people from interacting with the Web, but it’s true. I would be interested to know if students or faculty try to use Siri (or Cortana or Google Now) to access library content. Cennydd also talked about an increased role of motion and sound in interfaces, though his examples (beyond Final Fantasy) were largely about branding and not function. Sometimes you just need to clap behind the cat. Derek Featherstone spoke about designing for context and how our content and layouts can change with the context of time and/or location to provide better UX. He recommended designing to provide users the right content in the right context. Carine Lallemand summarized various research that’s going on in the discipline of HCI and UX, challenging us to change our methods to reflect that research. One thing that stood out for me was her point about UX happening over time: that there is anticipated UX before the interaction and then afterward episodic UX as people reflect on the interaction and cumulative UX when people recall many interactions. She said that “the memory of the experience can matter more than the experience itself.” Have a look at that again: “the memory of the experience can matter more than the experience itself.” This seems so wrong to me. We do user testing and not user interviews because what people say they do is not what they actually do. What they do is more important than what they say, right? But how they remember an experience will be a good predictor for whether they seek to repeat the experience again. Maybe yet again this ties back to “the harder you make it, the deeper the engagement.” Maybe, if you want to provide a great experience it really is important to go beyond what people do. But again, in a library context not everything has to be a great experience. Renewing a book doesn’t have to be the highlight of someone’s day. No one has to be deeply engaged when they’re booking a group study room. But I’d love to start thinking about where we can create and enable playful experiences in the library, where we can encourage deep engagement, the aesthetic UX that slows people down and provides a great memory. 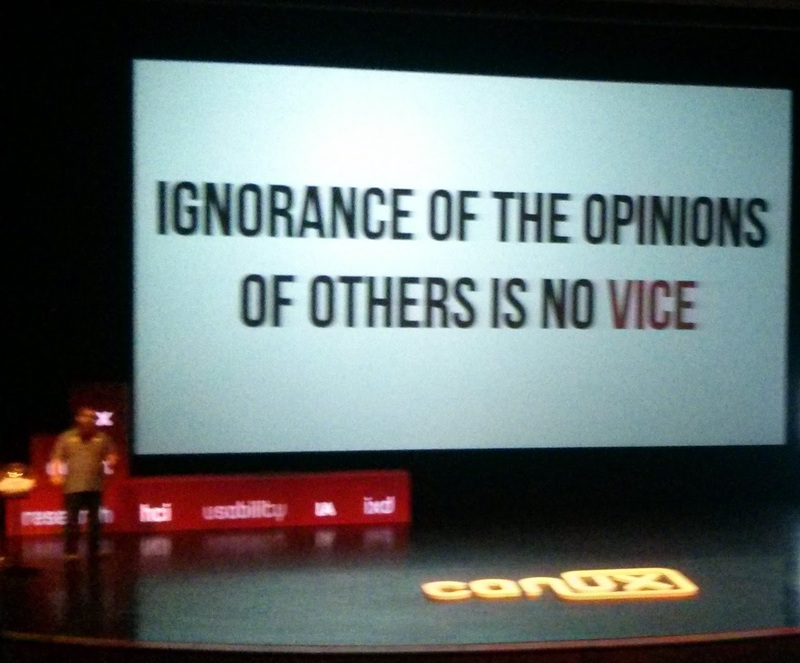 Thanks to CanUX for once again providing great food for thought.